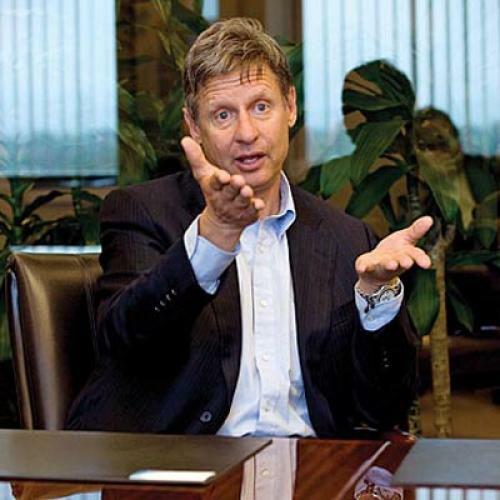 Like Ron Paul, whom he endorsed in 2008, Johnson is an unabashed libertarian-and, in some ways, a purer one (he’s pro-choice, pro-free trade, and pro-immigration). So, while he’s no culture warrior or foreign policy hawk—he opposed the war in Iraq and the troop surge in Afghanistan—he outflanks any Republican on fiscal issues, proposing an immediate, across-the-board 43 percent spending cut. “We’re on the precipice,” he says, of the country’s finances. To illustrate what lies in the abyss, at times he flashes his favorite prop: a $100 trillion bill from Zimbabwe that he keeps in his wallet. “Everybody’s been aware of it, even during the last campaign,” says Paul, whom Johnson informed of his intentions in April 2008. “I don’t remember when anybody didn’t assume that he would run for president.” Fortunately for Johnson, Paul, while not ruling out a second act, has shown little appetite for one. (“I have made no plans,” he told me.) And if he doesn’t run, he’ll “most likely” throw his weight behind Johnson. “I can’t imagine endorsing anybody else,” he says. The path, then, looks clear for Gary Johnson to become the Ron Paul of 2012—with one key difference: In the last election, wherever he campaigned, the dour Paul found himself surrounded by a traveling show—a motley movement of potheads, conspiracy theorists, and other colorful characters. This time, Gary Johnson is the show. At age 57—sporting Oakleys, blue jeans, and a white t-shirt—Gary Johnson still evokes the carefree irreverence of a college undergrad. “I was your C student,” says the former political science major. “I paid attention in the classes that were about how to get elected.” And, in 1994, it paid off. “He came out of nowhere in the Republican primary against bigger and better known opponents ... and then beat legendary [Democrats] with wide appeal,” recalls Bill Richardson, who succeeded the term-limited Johnson in 2002. What does Johnson make of Palin? On a drive through the foothills of New Hampshire, I ask him. Riding shotgun, he turns the question around on me. “Um, I guess some people think she’s folksy,” I say from the backseat. “Well, at first she strikes you as folksy,” he shoots back. “And then you realize: She might be running for president of the United States! And then, don’t we have the obligation to tell her what a terrible idea that is?” Cupping his hands to his mouth, he brays, “Sarah! We love you! Don’t run!” He also performs a rendition of the “deer-in-the-headlights” interview she did on “The O’Reilly Factor,” about the BP oil spill. Gary Johnson has his doubters, to say the least. “I think Lyndon Johnson has as much chance of winning the Republican nomination in 2012,” says veteran political handicapper Stuart Rothenberg. He’s right, given Johnson’s heresies on virtually all non-economic issues. That said, it’s not implausible that Johnson could gain traction (perhaps more than Paul did) in New Hampshire and other libertarian-minded states. He has considerable personal advantages over Paul—eight years of executive experience, greater campaign-trail energy, better communication skills—and today’s GOP is dominated by talk of the poor economy and the size of government, providing a far better climate for a strict libertarian than the one that prevailed in 2008. Moreover, assuming the Democratic nomination isn’t contested, independents should make up a much larger segment of the Republican electorate this time around in states, like New Hampshire, where they can vote in party primaries. And even voters who don’t line up with Johnson on the issues may still be charmed by his freewheeling style. Benjamin Birnbaum is a reporter at The Washington Times. This article ran in the November 11, 2010, issue of the magazine.